More sweeping than the north east coastline and less indented, the north west has long stretches of high macchia covered cliff and hillside, an abundance of sandy beaches, small resorts and historic towns. Vineyards of Sella and Mosca - The vineyard of Sella and Mosca makes an interesting afternoon's visit. Guided tours are available daily followed by wine tasting. 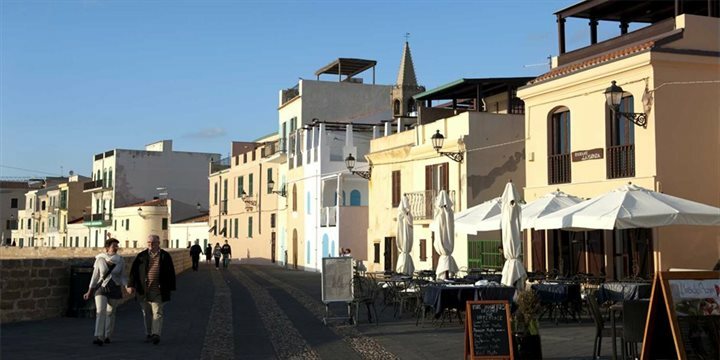 Alghero's Bastion - Get away from the hustle and bustle of lively Alghero, stroll along the fortified walls along the seafront and enjoy the sun setting over Capo Caccia. Grotte di Nettuno - Take a boat trip to the Grotte di Nettuno, outstanding sea caves below a sheer cliff face. Accessible by boat, trips depart regularly from Alghero's port and the return journey takes approximately two and a half hours. Bosa - Travel south down the coast road to Bosa, where some interesting rock formations are to be seen on the way. Bosa is a picturesque tangle of narrow streets and squares below the ruins of a medieval castle. Archaeological sites - Visit some of the important archaeological sites, both near Alghero and further inland, including the Nuraghe di Palmavera and the impressive prehistoric necropolis of Anghelu Ruiu.